The time has come for Rayquaza and with it dawns our Rayquaza Duo Contest. 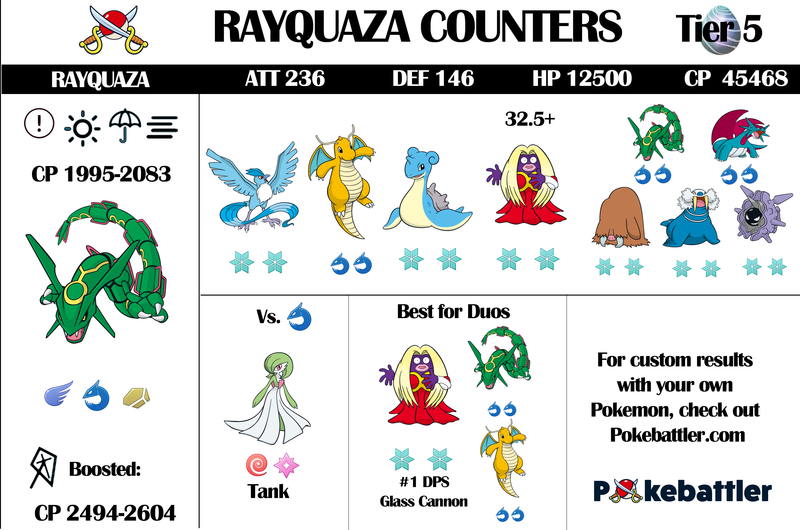 So we’ve designed this infographic with a special section just for duo-ing while also including normal counters for Rayquaza for those who just want to catch this cool new legendary! To see what he’s good against, check out this link. I must say, it’s nice having another Dragon-type generalist besides Dragonite, especially now that Dratini are basically impossible to find (excepting the upcoming Community Day, hopefully!). Rayquaza is a Flying/Dragon legendary. He’s very high DPS and is the NUMBER ONE OVERALL ATTACKER by time to win, and number 5 as an attacker overall- he’s a bit of a glass cannon. High attack, not as great defense. There are, however, some interesting things that happen as different counters change level. For example, Jynx moves in her rankings at every level between 30 and 40, going from number 8 to number 2 depending on the level. This is one of those times where looking at custom results is extra important, and checking out our advice tool to see where breakpoints are as they are really important for glass cannon types like Jynx. Outrage – This move is in competition with Shadow Ball as the best move in the game. It is rarely resisted by anything. It is by far the strongest on both attack and defense and worth TMing to get. Ancient Power – A weak and slow three bar move. Fairly easy to defeat. Aerial Ace – An even weaker three bar move but faster. The easiest special move to defeat. Dragon Tail – An awesome fast move. This is the best move on both attack and defense and hits hard enough to make it rough for Dragon-type counters. Definitely worth TMing for. Air Slash – A good fast move but outclassed by Dragon Tail. The time has come to breakout this legendary ice Pokemon as he is strong against all of Rayquaza’s moves, even Outrage. Blizzard and Ice Beam are his strongest charge moves, with Icy Wind putting him much lower on the list you so may want to consider using a TM on him if you have Icy Wind. Articuno is still strong but moves down the list a bit under Rayqauza’s Ancient Power Charge move. Rayqauza is weak against Dragon moves, so of course, Dragonite is going to show up as a strong counter. Dragonite starts off lower on our counter list at level 30, but makes a big jump as he increases in level up to number two at 36. This is a complicated defensive breakpoint situation so it’s important to look at in our advice tool for your exact Dragonite’s breakpoint. Hopefully, you’ve already got at least one strong Dragonite by now. He’s very strong against Ancient Power and Aerial Ace, but he’s not as good against Outrage. At very high levels, he can survive 2 Aerial ace and 1 Outrage, providing good DPS but Dragon Tail/Outrage will still be a bad matchup. Time to bust out those Lapras you’ve hopefully been saving. They haven’t been too useful up until now. Legacy Ice Beam is the best special move for Lapras so if you have that you are good to go. If not, Blizzard is next best and still makes a respectable showing. I think Jynx’s name is very appropriate here because she is a tricky little minx when it comes to where she falls as a counter to Rayquaza. She’s a classic example of a glass cannon. She’s high DPS but low defense, or as we like to say, ‘squishy.’ She’s like the opposite of Blissey. She moves all over the charts depending on her breakpoint, which is at 32.5 with 15 defense and 15 stamina or more depending on her IVs. But after she hits a certain breakpoint she barely gains any effectiveness, so please use our advice tool for her before you waste stardust on this rarely useful Pokemon! We will discuss Jynx more in the Duo section below as she will be important for those entering the contest. These ice Pokemon are not as strong as Lapras or Articuno, and are all pretty even with each other overall, but still make good general counters against Rayquaza. You definitely want them to be double ice, other movesets won’t be as effective. This duo of dragons is decent against Rayquaza against all his moves. However, dragon moves are super effective against both of these attackers and Outrage Rayquaza should be avoided if possible. We’ve had many smart redditors point out that we forget to mention Golem. Although he isn’t as strong of a counter as the above ice or dragon Pokemon, a double rock Golem is a good general counter, especially with a Partly Cloudy weather boost. And since many of us have powered up Golem for previous raid bosses, he is likely to come up as one of your top counters when you use our Pokebox feature to look at your custom counters. If you’ve managed to get yourself a high-level Gardevoir already, first off, how??? I’ve only caught one unevolved Gardevoir. However you managed it, Gardevoir with psychic and fairy moves is super tanky against the powerful Outrage because of Dragon’s effectiveness vs Fairy, but not as useful against any other Rayquaza moves. So this is a case of knowing what Rayquaza’s moves are ahead of time before choosing her. The easiest way to do that is to jump into the gym real fast, wait for a charge move, then exit. Then chose your counters. Let’s get Ready to DUO!!! For those of you hyped to enter our contest, there are a few standouts that will give you the best chance. Outrage Rayquaza will be the hardest to beat but the other 2 specials are definitely within reach for even level 30s (with snow). 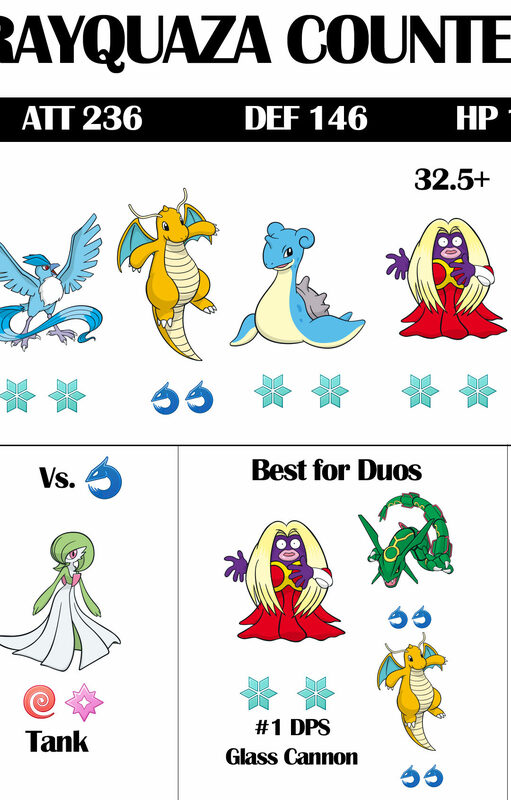 Sans weather boosts, one queen reigns supreme for duoing Rayquaza. Buy me a Coke. Sorry, I couldn’t help myself. Anyways, she’s super high DPS, but like we’ve said, hella squishy, so both you and your duo buddy will need a Jynx army to take down Rayquaza, and one without outrage. Do you want to spend insane amounts of stardust and candy on an army of Jynx? Apparently, some of you do and already have, according to our contest response. Frost Breathe and Avalanche is her strongest overall moveset. Again, do you want to use a bunch of TMs just to win our contest? We leave that up to you. We’re just giving you the facts people. Dragon is weak against Dragon, and Rayquaza and Dragonite armed with Outrage made formidable foes against Rayquaza. They don’t have as high of DPS as Jynx but are still quite competitive against Outrage. Dragontail is the strongest quick move for them both. We expect the winners to use an army of Jynx, but these guys could be in there too possibly. Only time will tell! Rayquaza will be a useful high attack generalist and a nice new Dragon/Flying Pokemon to add to your arsenal. You’ll want to catch a few strong ones for sure. He has definite weaknesses, although his Outrage move is strong, and things can get squirrely with glass cannon mons like Jynx so pay attention to breakpoints. He’s just barely duoable in certain situations, which is why we are holding a contest to see who can do it first! Thanks for reading and good luck out there! Always check our custom raid guides using our Pokebox feature to see which of your own Pokemon will do the best because everyone’s results are different! Happy hunting! How did you catch an unevolved Gardevoir? Stage 3 Gen 3 evolutions don’t spawn in the wild. In most regions of the world, Windy is a more likely weather than Snow, so I expect the path of least resistance for a duo to be a Dragonite+Jynx army (and maybe one or two Rayquaza for those with deep reserves of stardust and Rare Candy) in Windy weather. And it got done by a weather boosted army of Walrien instead? And this guy uses one with Earthquake! Contest should have been based on time not who had best weather and where one spawns first? Thanks for all your help! Love the site! Top 10 Pokemon For Silph Arena Regionals Season 1!